Keppel Land is expected to begin sales of its Highline Residences condo, diagonally opposite Tiong Bahru MRT Station and Tiong Bahru Plazamall, on Sep 13. Market watchers note this will be the same day the showflat for Marina One Residencesis expected to open for viewing. Keppel Land's spokeswoman could not confirm the date when sales will begin for Highline Residences but said: "We have given a market guide price of $2,000psf (on average) and response has been good." The guide price is before an undisclosed "special preview discount" that will be given for purchases by registered prospects. Prospective buyers were invited to a preview of the project last weekend. Another session will be held this weekend. Market watchers guessed that after discounts, the average price could be around $1,800 - 1,900psf. They noted that sales at The Crest along Prince Charles Crescent have been sluggish. As at end-July, only 39 of the condo's 469 units had been sold, based on government data on developer sales. The project was released in June this year, with 35 units sold at a median price of $1,682psf in that month. The Crest, being developed by a Wing Tai-led consortium, is a stone's throw from Jervois Road and the Chatsworth Park Good Class Bungalow (GCB) area. It is about 450 metres from Redhill MRT station and features spacious units. Closer to Redhill station, Alex Residences was released last November, with 171 units sold at the $1,706psf median price in that month. As at end-July, 208 of the project's 429 units had been picked up. Location wise, Highline Residences is deemed the most attractive given its proximity to Tiong Bahru MRT station, which is closest to town. Redhill MRT station is one stop away. The Tiong Bahru location also has more amenities, including a mall and eateries. All three projects are sited on 99-year leasehold land sold at sate tenders. The Crestsite fetched $960psf ppr at a state tender that closed in September 2012. The Alex Residences site was transacted at $970psf ppr in December 2012. 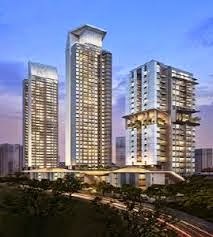 Highline Residences' site was secured at $1,163psf ppr in April 2013. Highline Residences will comprise 500 units housed in two 36-storey towers, a 22-storey tower and four low-rise blocks. Unit size range from 506sqft for one-bedders to 1,227sqft for four-bedroom dual key units. Highline Residences will also have six penthouses of between 2,174 to 2,260sqft. The project is designed by Mok Wei Wei of W Architects. The development will feature a rooftop communal garden facility to encourage urban farming and healthy lifestyles. Residents may also tap concierge services such as limousines and housekeeping, in addition to enjoying complimentary golfing at Keppel Land's Ria Bintan Golf Club. So the much anticipated project at the City fringe has finally been put out for sale. The wife and I have passed by the boarded site of Highline Residences several times over the past months and have been wondering when Keppel Landwill do the launch. While we agree that the location of Highline Residences triumphs over both The Crestand Alex Residences in terms of convenience (Tiong bahru Plaza and Tiong Bahru market) and "hip" factor (the much-lauded Tiong Bahru Estate precinct), The Crest probably score better in the "exclusivity" department (i.e. on the "correct" side of Alexandra Road bordering District 10 and surrounded by mostly condos and GCBs ). 1 comment to ''New project info: Highline Residences"
What, in this climate? Very hard sell indeed!